I'm back to New York! I wanted to write about everything I did in Montreal last week for the holidays but really, I just want to show you everything I put in my mouth and into my tummy. I guess all I did in Montreal was eat! There could be more pictures with this post except I was trying this new thing where I would NOT be taking pictures of food anymore. Because of that, I am missing pictures of some meals which is cool until I decided that I wanted to write about it. 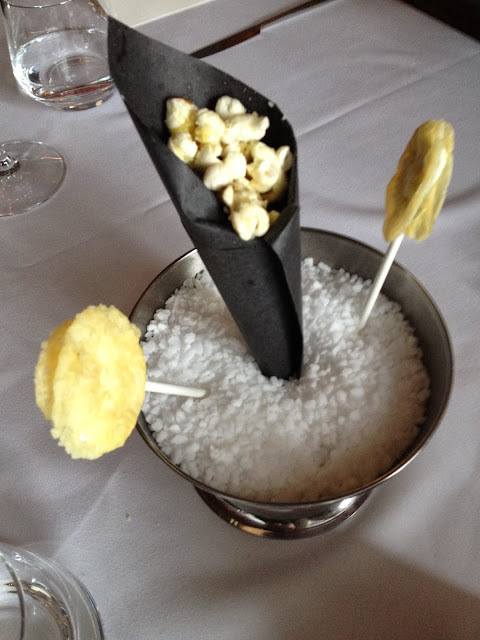 When we started going to these fantastic restaurants, I just couldn't put my phone away. So brace yourselves, here are all the food pictures I did end up taking which you may have seen on my instagram if you follow me! I took an overnight bus from New York and was pretty tired but in good spirit. On the morning, I arrived, an old friend of mine came to pick me up and took me to breakfast in Griffintown. We went to Quoi de N'oeuf and I had an egg benedict. It wasn't the best but I was exhausted and not too hungry. For dinner, I joined my sister and a new friend at a fairly established polish restaurant in Old Montreal. 30-year old Stash cafe. I had some traditional stew bigos and since they screwed up a vegetarian plate one of us ordered and didn't want to waste it, I got to taste some pierogi, placki and krokiet. I'm not super familiar with polish food but all of those things I named are supposed to be classics! The next day, I visited a friend from high school who lives just 5 minutes drive away from my sister's. He had a to-die-for apartment I wish I had in New York. I was in awe and spent a good 7 hours lounging there with my sister on Christmas eve. Before going there, we went to satisfy my poutine craving by picking up two plates of delicious double-fried poutine from a hole-in-the-wall place Restaurant AA. After that, my friend had us try a piece of Yule log (a.k.a. bûche de Noël) from our friend's bakery, Pâtisserie Rhubarbe. I have yet to visit her bakery and try the raved-about brunch she offers! On Christmas day, my sister was planning on inviting a couple of her friends over for some Chinese hot pot but it was cancelled as one of them could not take the day off. 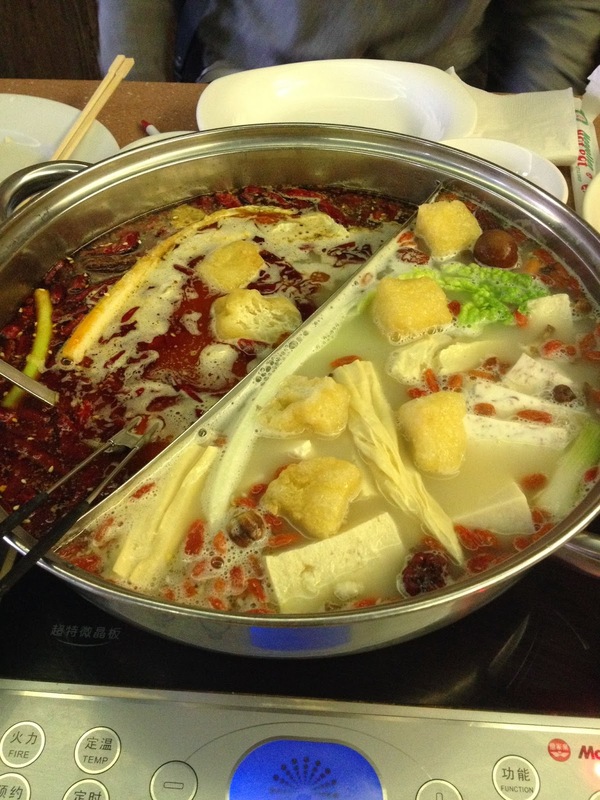 We still craved some type of hot pot and so we headed to Chinatown for Mongolian hot pot at Little Sheep hot pot! On boxing day, I met up with another old friend of mine who is visiting all the way from California. We went to Alexandre et fils for lunch which was supposed to be a light meal since I had early dinner reservations but instead, I got a three-course lunch with bavette and french fries and was stuffed. Dave came up that day from NY by hitching a ride with his friends and joined me and my sister later that night for dinner. We cancelled our reservation at Park restaurant since we opted for somewhere closer for convenience sake. Good thing she lives in a up-and-coming hot hip area. Just two blocks away, there was a much raved about restaurant called Grinder. We managed to get early reservations for 2 hours since it's usually fully booked. The picture of the oysters is the only photo I took at Grinder and only after we ordered a second serving. They were so good and fresh, we had to get some more. After that, my sister ordered 3 super delicious appetizers (scallops tatakis, salmon gravlax and the so good potatoes "aligot"), Dave had a simple vegetable salad entree and French onion soup to pair. He decided to eat "lighter" since he had a poutine and burger for lunch at La Banquise with his buddies. 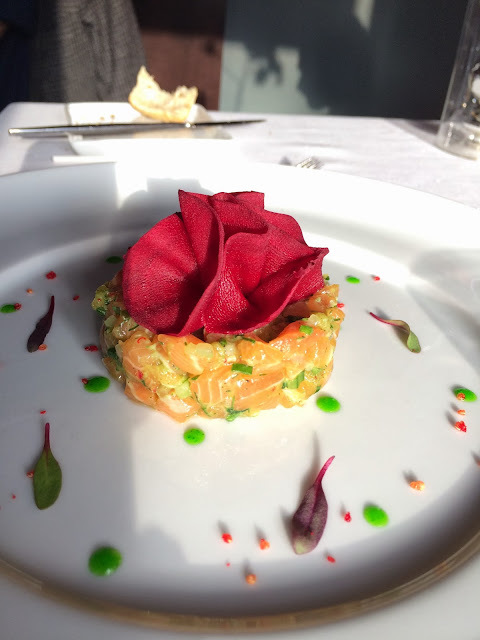 For me, I had the salmon tartare and two cocktails and I was happy as it can be. 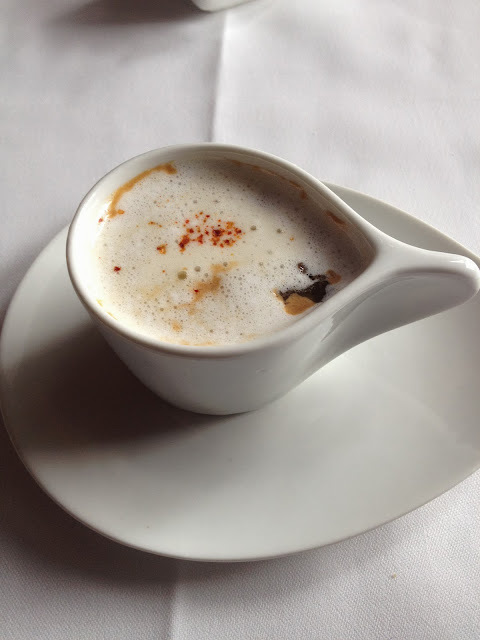 Montreal tartares are simply the best of the best. I wish I did take more pictures but I highly recommend this restaurant in the heart of Griffintown! The very next day, we celebrated a birthday at Europea which is now on my list of highly recommended restaurants in Montreal. My sister never fails to find some of the best restaurants in town to try and I was happy she insisted for us to join her. She didn't insist to hard but I had been in Montreal for almost 4 days and ate out almost every single day so I was craving for some homecooked meals already. But I am glad I joined. This is also the meal I decided to put my new resolution aside and started taking pictures of every single plate except maybe the main course and the final desserts. Everything was so nicely presented, I couldn't help it. The meal was slow but oh so carefully prepared. We all picked the three-course lunch meal. Complimentary starters and desserts were a super nice touch! I want to make truffle popcorn too now! For the main courses, we had the cod, mushroom gnocci and smoked bison! The presentation for the smoked bison was pretty fancy. A glass dome encased actual smoke over the bison! Oops, didn't take a picture! 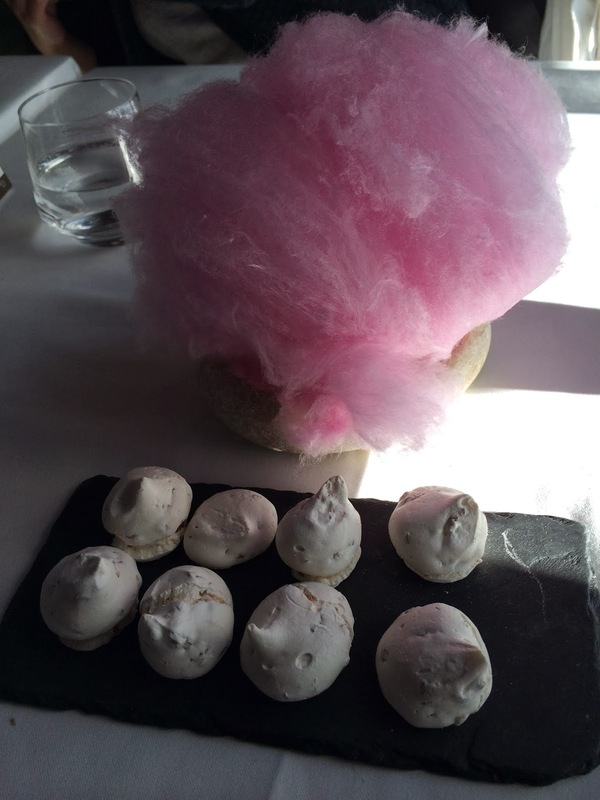 This is the second time I've gone to a restaurant which serves cotton candy at the end of the meal and it never fails to bring so much joy to the table! I didn't take a picture of the choice of more than 5 desserts we were able to pick from :( There were so many excellent choices it was hard to pick just one but good thing sharing is caring. We tried the berries panna cotta, crème brulée, chocolate mousse and lemon tart in a cup! Because of the birthday boy, we also tried some rose macarons! Finally, the restaurant I made reservations for a month in advance and then didn't show up but decided to go anyway after an hour of contemplating what we were going to eat. I was being really picky and annoying about what to eat because I was struggling between eating in and craving a big healthy salad or eating out at yet another highly-raved about restaurant! Next stop, Maison Publique. This is also now on my list of highly recommended Montreal restaurants. And this time, I took a picture of every plate. We were only three people. this salad was pretty darn good. Salad haters would love this! After Maison Publique, we actually attempted to go to Au Pied de Cochon for dessert but they didn't have the pudding chomeur we went there for. We also bumped into our friends who came from NY to eat as well. They were at PDC for a 10:30 p.m. reservation! The place was packed as usual so we left. No dessert but there was a C list celebrity sighting. Too bad I'm not a fan of Twilight! Finally, on Saturday, we finally got some home-cooked meal for lunch at Dave's cousin's place. We weren't planning to eat there but when the food was made, we were more than delighted. That noodle soup with homemade dumplings was almost a cleanse. 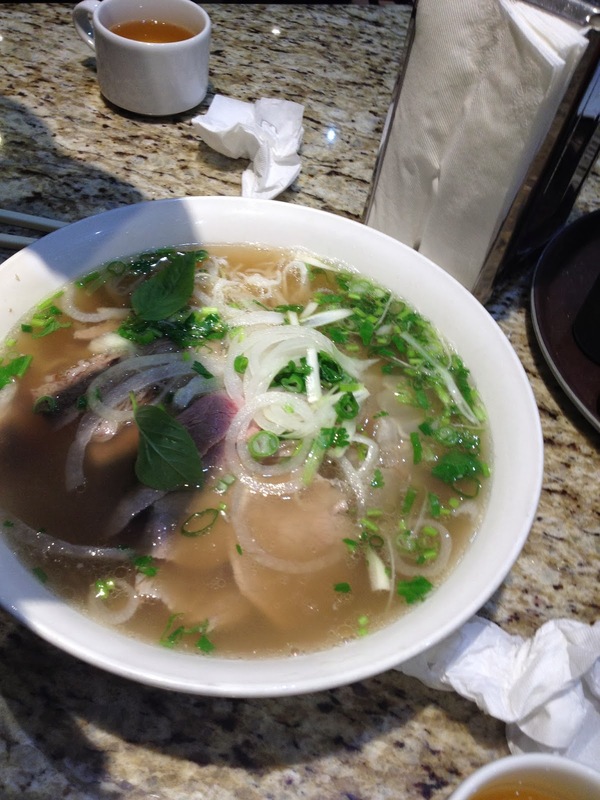 We were leaving for New York that night and so our last meal before leaving Montreal had to be pho. The pho in Montreal is just much better than anything I have tried in New York. We went to Pho Cali in Chinatown. Not because it is the best but because it was convenient. 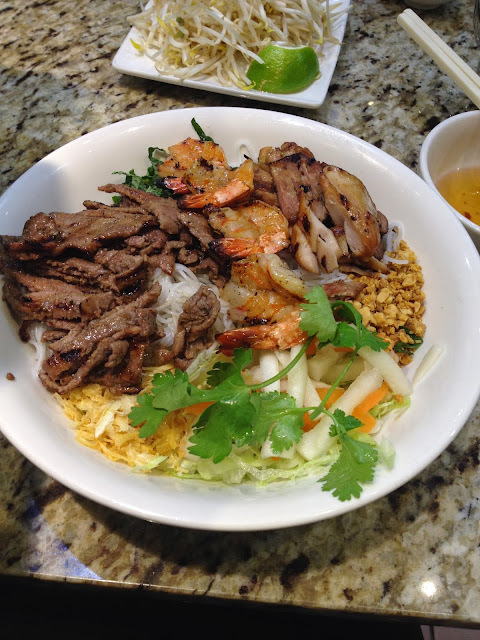 Since I was able to eat from Dave and my sister's bowl of pho, I opted for the meat/seafood rice vermicelli combo to get the best of both worlds. Mmm! And for the trip back home, I went to Hoang Oanh to pick up 6 viet sandwiches for the road. Still my go-to place for banh mi sandwiches! Thanks for reading!! Hungry yet?